Located in the pedestrianized part of the High Street. Close to Sports Direct, Superdrug, Poundland, Thomas Cook and Top Shop. Approx size 128.82 sqm 1385 sq ft.
Suit wide variety of traders. 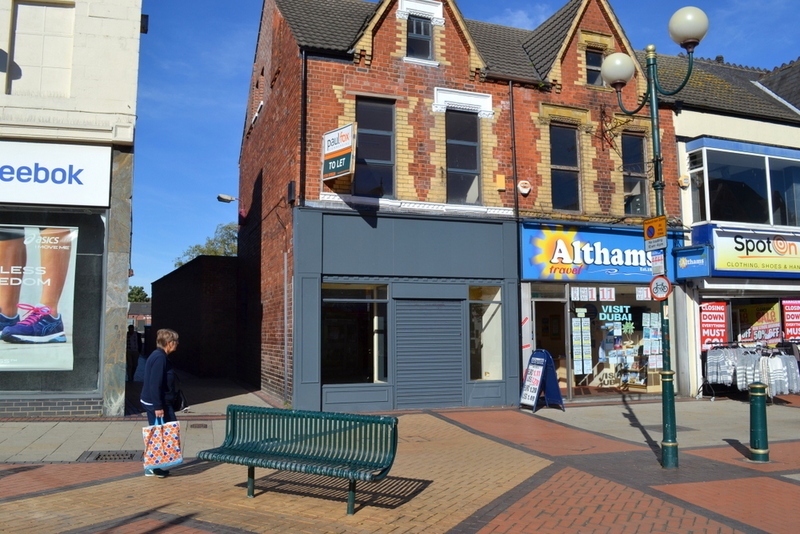 The unit is located in the centre of Scunthorpe which has a population of approximately 75,000 and is increased significantly from the catchment of the surrounding villages. Scunthorpe is the commercial centre of North Lincolnshire and has a range of industry, retail and amenities commensurate with its stature. The property occupies a prime corner position in the central part of the pedestrianised High Street. The unit is a short distance from both the Foundry and Parishes shop centre. In close proximity to the unit is Sports Direct, Superdrug, Poundland, Thomas Cook and Topshop. A pedestrian walkway on the western side of the unit leads to a large Local Authority car park. The unit is an attractive three storey brick built building. Ground floor comprises of front sales area with recessed double personnel entrance doors centrally placed providing for two display windows to either side. Secondary sales/storage area divided from the aforementioned by a stud wall. Rear store and WC accommodation along with rear access. An internal staircase provides access to the first floor storage area with trap door access only to second floor. Electricity, water and drainage are understood to be connected to the subject property. Services have not been tested and prospective occupiers are advised to check the adequacy of the supply for their intended use. EPC commissioned. The subject property is available by way of an occupational lease the terms of which are negotiable. The tenant to hold on a new full repairing and insurance lease. Each party to be responsible for their own legal costs. Note: the landlord may consider converting upper parts to a first floor flat.